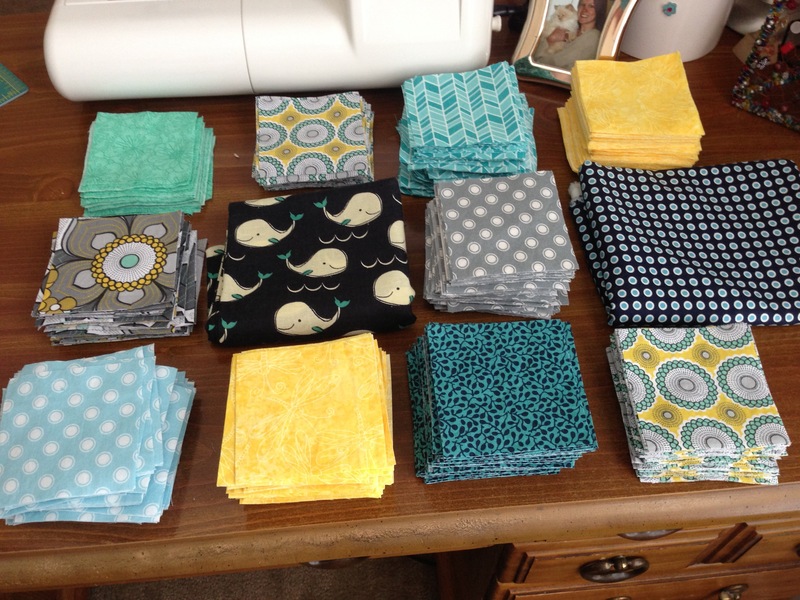 Quilting Part 1: Blocks, Strips, and Squares, Oh My! After my latest sewing successes, I have begun my king size quilt. Should I probably make a smaller quilt first to get conditioned for the quilting version of the Boston marathon (or maybe the Iron Man competition!)? Yup. But a king quilt could easily be divided into smaller quilts that can then be sewn together, so really, a king size quilt is simply quilter delayed gratification. I’ve named our quilt “Twelve Bar Blues” because I’m using a repeating pattern of 12 quilt squares that are mostly in the blue family (and because I happen to be a music nerd-History of Jazz, anyone?). Here’s a sneak peak! Since I didn’t buy enough material on shopping trip #1 and the store didn’t have any of my original choices left For visual interest, some of the main squares in the pattern will be substituted with these other fabric squares, some at repeating intervals and others at random (okay, I wanted some “planned randomness” anyway but ended up with more randomness than what I initially had in mind). Rather than save up this REALLLLLLLLLLLLLY LOOOOOONG project to post all at once, I’m going to post in several installments, beginning with today’s post on calculations and shopping. Planning TIP #1: If you have never quilted before, proceed with caution when looking at quilter forums and expert quilter blogs for how to calculate material. Supply list? Yes. Advice on material purchases? Maybe, depending on your taste and style. Calculations? Nope. Some of the quilting pages provide Calculator applets to help you calculate material you need by the size of quilt you intend to make and the size of squares you wish to use (if using quilt squares at all). Trouble is, some of these don’t actually function correctly, and some of them calculate the number of blocks you need, not the number of squares. This results in newbies, like me, returning home with one-fourth of the fabric I needed to make my quilt, feeling like there was something VERY wrong but trusting the experts that I could, in fact, defy the laws of nature. I should have trusted my own mathematical prowess instead. This brings us to Planning Tip #2: Do your own math. Some of these “helpful” online tools don’t factor in the seam allowance you want to have for each square (i.e., if you want 3″ squares, you actually need to plan to buy material for 3.5″ squares to allow for a quarter-inch of fabric on each side to be stitched together to form quilt blocks).I wanted to make a king size quilt, and most king size bedding is typically 107″ x 108″. I decided to make a nice square to make calculations easier, so I am making a 108″ x 108″ plus the binding, since I want it a little bigger to snuggle in. After a sobfest over trusting the “experts”, having to confess to my husband that the $$ I spent on quilt fabric was only a fourth of what I actually had to spend, and listening to him respond, “If it’s that expensive, then why aren’t we getting that Pottery Barn thing then?”), I did my own calculations, first finding the area of the quilt and then dividing that by the area of my finished quilt squares (3″) to get the number of squares I would need. Then I created a pattern on graph paper to serve as a scale model of my quilt and added up how many of each kind of quilt square I would need for my pattern for the entire quilt. From there, I calculated the area in a yard of fabric (typically 42″ x 36″) and subtracted that by the area of the size of INITIAL quilt squares (3.5″ x 3.5″) I would need to get a better estimate of how many quilt squares per yard I could likely get. Then I used that to determine how many yards of each fabric I would need, in relation to the numbers needed for my pattern. For example, the blue leaf quilt square is used once in the 12-bar pattern, so I needed 108 squares. If I can get 110 squares from one yard (which was often the case with my fabric), I only need 1 yard of blue leaf fabric. The yellow dragonfly is used twice in the pattern, so I needed 216 squares, or 2 yards of fabric. This brings us to Planning Tip #3: Shrinkage estimates are unreliable, so buy half a yard more of fabric than you think that you need. Some of the quilting websites and books apparently don’t factor in fabric shrinking resulting from prewashing your fabric (which you should always do! ), and let me just tell you, the 3% shrinkage estimates reported are not reliable (some report 3-5%, but some of my fabric definitely exceeded this estimate, too!). These webpages will tell you how many of X size quilt squares you can get out of a fat quarter, half yard, or full yard. Do not believe them. Think Pirates of the Caribbean when Elizabeth invokes the right to parley (pronounced par-lay) and finds out that the pirates’ code is more guidelines than actual rules. Not only did ZERO of my fat quarters, half yards, and full yards provide the “right” number of squares they indicated (e.g., 30 3.5″ squares from a fat quarter), all of my fabrics yielded FEWER squares than these “experts” indicated and never the exact same number per amount of fabric. My personal estimates were usually more reliable than those of the “experts,” but some of the fabrics didn’t even meet my own, more conservative estimates. This is yet another reason why you should (1) buy extra fabric the first time around, (2) prewash, and (3) buy fabrics of the same quality weight, as not all fabrics (even all 100% cotton quilting fabrics) shrink equally. You expert quilters may be thinking, Well, she obviously doesn’t know how to cut her strips correctly. Possible? Yes, but I followed “quilting expert” directions on how to do it, so these people may have a problem communicating what they ACTUALLY do (wave a magic quilter’s wand?). Maybe some of the fabric cutting peeps I had at the craft store were woefully inadequate cutters of fabric. Possible? Yes, given that most of them look to be 16, bored, and easily distracted by conversation (“You’re making a quilt? I could never quilt. Cutting all those squares would take, like, FOREVER, and I would TOTALLY give up.”), your chosen fabric (“OMG! Chevron is SO hot right now!”), etc. I even found some little irregularities in the fabric (at home…after it was cut…and after it was washed when I was ironing and could no longer return it, le sigh) that they had overlooked when cutting my fabric. UGH! A young man and an older lady who cut my fabric at different times at the craft store did a beautiful job of inspecting and cutting the fabric, so this is not the store’s problem but rather a problem with the typical teenage workforce in general. In addition to the cutting challenges (straight line, anyone? ), some of my fabrics were not actually the full 42″ in the first place, so some of them were a full strip short. My new estimate for the number of 3.5″ squares in a yard is 110. A final thought on shrinkage: I had one fat quarter that was the equivalent of the proverbial wool sweater that shrinks so much in the wash that it now resembles doll clothing or a lovely pet sweater–no joke! It looked like maybe 1/16 of a yard. Maybe. This brings us to Planning Tip #4: Do NOT buy fat quarters for quilting. Especially for big quilts. A concluding thought from phase 1: After reading some online reviews of fabric from the same, popular craft/fabric store I used, apparently other (and more experienced!) quilters have had similar problems with excessive shrinkage of various quilting fabrics from this store. Consequently, it is likely that I will not be purchasing fabric for quilting from this store again until there is evidence of quality improvement from others’ reviews. So now that I have learned these valuable lessons about calculating and shopping for fabric and have, most importantly, shared them with YOU, I will proceed to writing about phase #2: washing and cutting. Stay tuned!